The Irish Water Spaniel, having originated in Ireland in the mid 1800s, is the largest and oldest dog of the Spaniels. They were very popular during 1870s but over time they were replaced by Labrador Retriever. Apart from being the oldest and largest, it is also unfortunately one of the rarest breeds. It is a lively, robust and an ever-ready companion. They are strong, courageous, attentive, and inquisitive and also have a vigorous endurance. Irish Water Spaniels are very clever, confident and dedicated but they seek attention in return. They enjoy interaction with mankind and are best with mature children; however, if groomed properly, they will also get along with other pets. They are on the whole very quiet and bark only when needed. They are protective, aloof and alert in the presence of a stranger but not at all fierce. They show spice and liveliness towards life. Owing an Irish Water Spaniel may cost you a lot because it needs a lot of grooming, they should be brushed everyday and regular professional trim of coat is a necessity. Their body is covered with ringlets of hair which is crisp in texture and brown in color. However, tail, face and ends of rear legs have smooth short hair as compared to ringlets. However, one advantage of this breed is that it does not shed any hair. Irish Water Spaniel is a fast learner if tough, just and consistent training is adopted. However, at other times they may prove to be very obstinate. This breed need an ample amount of daily exercises and enjoy swimming, hunting, walks etc. They have a love for open space and thus are best suited for the country or suburbs as compared to apartments. 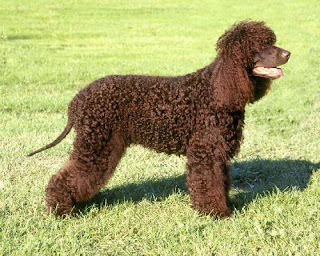 Irish Water Spaniel is at a risk of elbow dysplasia, hip dysplasia, thyroid problems, and eye problems. They may live for a period of 10 to 12 years.